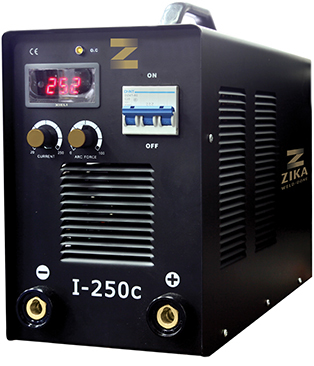 Stick Welding Machines - I-250c – Zika Industries Ltd.
Home Catalog Welding & Cutting Machines Stick Welders Stick Welding Machines - I-250c – Zika Industries Ltd.
A lightweight industrial welding machine designed for welding jobs, maintenance, pipe and general joining jobs requiring continuous work with electrodes of up to 5 mm diameter. 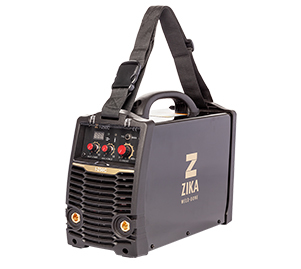 A welding machine that provides for continuous, intensive welding work at 100% efficiency at 180 amps. The welding machine has full overload protection. The welding machine has full open phase protection. May work with a generator of 15 Kva output. Digital display for convenient, precise adjustment of current. Three phase protection circuit breaker at front of welding machine. A rigid, IP21 rated dustproof case for use in outdoor conditions. A ventilation system with a unique structure that combines a strong fan with a very large passive cooling unit. Professional and technical consultation of welding experts. 25 mm2 cross section welding cable. 25 mm2 section earth cable. 2 meter standard power cable and standard approved 3 phase Israeli type plug.